In a medium bowl, whisk the flour with the almond meal, 1/4 cup of the Parmigiano and 1 tablespoon of the salt. In a large bowl, combine the warm water with the yeast, sugar and 2 tablespoons of olive oil. Let stand until the yeast is foamy, about 5 minutes. Using a whisk, stir in the egg until just combined. Add the dry ingredients and, using a rubber spatula, stir until combined. (The dough will be wet, more like thick muffin batter.) Scrape the dough into a lightly oiled bowl and turn the dough to coat. Cover the bowl with plastic wrap and let rise in a warm, draft-free spot until doubled in bulk, about 1 hour. Generously brush a 9-by-13-inch baking pan with olive oil. Using a rubber spatula, scrape the dough into the prepared pan. Use lightly greased hands to pat the dough into an even layer and into the corners of the pan. Cover loosely with plastic wrap and let rise until doubled in bulk, about 1 hour more. Discard the plastic wrap. Preheat the oven to 450°. Bake the pizza crust for 20 minutes, until it is golden brown and springs back lightly to the touch. Transfer the crust to a wire rack. Meanwhile, in a medium skillet, heat 1 teaspoon of oil over moderate heat until shimmering. Add the sausage and cook over moderate heat, breaking the meat into bite-sized chunks with a slotted spoon, about 6 minutes. Transfer the sausage to paper towels to drain; wipe out the skillet and return to the stove. In the same skillet, warm 1 teaspoon of olive oil until shimmering. Add the kale and generous pinches each of salt and pepper. Cook, stirring frequently, until barely tender, about 3 minutes. Remove the skillet from the heat. Spoon the marinara sauce over the crust, leaving a 3/4-inch border around the edges. Sprinkle the mozzarella over the sauce. 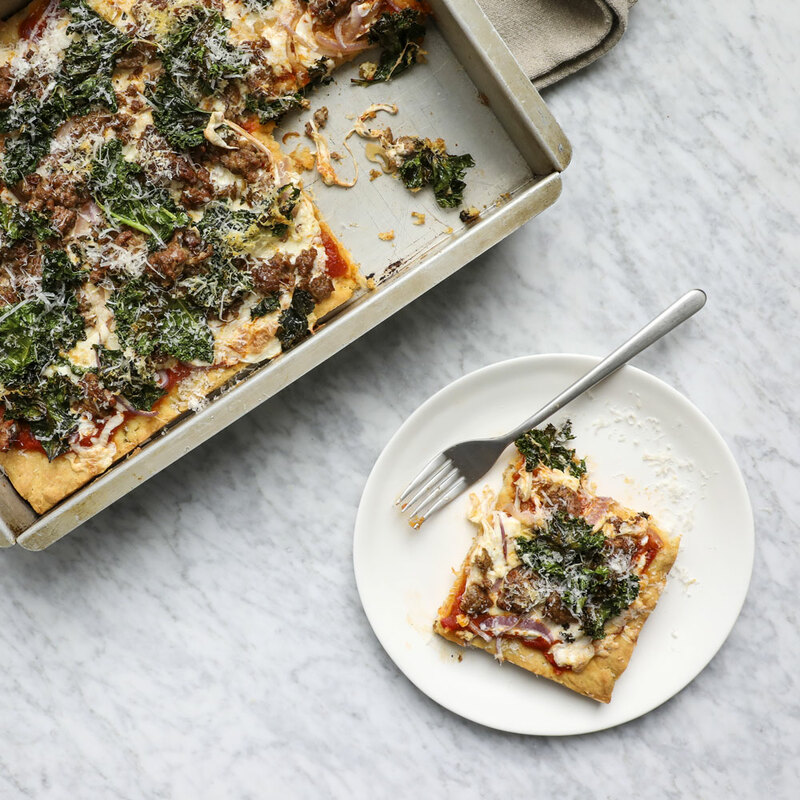 Top the pizza with the sausage, kale and red onion and sprinkle with the remaining 1/4 cup of Parmigiano. Bake for 15 minutes until the cheese is bubbling and beginning to brown, rotating from front to back halfway through the baking time. Transfer to a wire rack and let stand for 10 minutes. Sprinkle with remaining 1/4 cup of Parmigiano and cut into squares.